First of all, let’s get through the name issue. 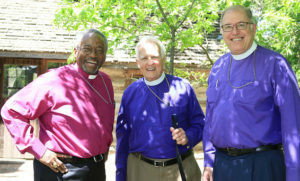 Presiding Bishop Michael Curry with Fort Worth bishops Sam B. Hulsey and Scott Mayer. The word “Episcopal” means “of or pertaining to bishops.” The word for “bishop” in Greek is “Episkopos,” which literally means “overseer.” Our church is called “Episcopal” because we have bishops. Other churches also have bishops (Roman Catholics, Eastern Orthodox, and Lutherans, among others). Bishops are ordained women and men who have a special role at the regional level for oversight and governance of the Church. According to our tradition, the twelve Apostles were the first bishops of the Church, and all the bishops throughout history up until now are their successors in this role. The Episcopal Church has its roots in the Church of England, which in turn has its roots in the Roman Catholic Church and the Protestant Reformation. The Episcopal Church was established as independent from the Church of England during the American Revolution. It’s worth noting that many of the Founders of this country, and most of our presidents, have been members of the Episcopal Church. Just as the United States was the first of many former colonies to break away from England,The Episcopal Church led the way for a series of independent churches of English heritage to form all over the world. These churches, from Canada to New Zealand and every place in between, together form the worldwide Anglican Communion. Though our churches, like our countries, are independent and self-governing, we share a common heritage in the prayer traditions of the British Isles, a common belief in Jesus Christ, and a common mission to proclaim the Good News to all people. The Anglican Communion and the churches that comprise it are a part of the one, holy, catholic, and apostolic church, of which every baptized Christian is an indispensable member. For this reason we respect the diversity of Christian thought and theology, and welcome ALL OF THE FAITHFUL to share communion at our table. Whatever your tradition or heritage, whatever your beliefs or baggage, whatever your affiliation or orientation, you are welcome at our table. 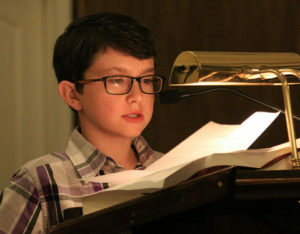 The Episcopal Church believes that the Holy Scriptures (the Bible) are the revealed word of God, and “contain all things necessary for salvation.” Far from Biblical fundamentalism, we believe that this revealed word is best interpreted within the community of the Church, guided by tradition, reason, and the ongoing work of the Holy Spirit. We read the Bible together in every one of our services, and we study it together in smaller groups and individually. Explore some resources for your own study. A part of that tradition is a statement of belief known as the “Nicene Creed.” A “creed” is simply that- a statement of what a person or a group believes. “Nicene” just refers to the place where it was formally adopted (a city in Eastern Europe called Nicaea). The Nicene creed is a foundational text for most Christian churches, expressing basic understanding of the nature of God, Jesus, the Holy Spirit, and the Church. You can read the entire Nicene Creed here, or you can pray it with us just about every Sunday morning. Another part of out tradition is The Book of Common Prayer. The BCP (as you will often see it abbreviated) is, to put it simply, the “instructions” for public worship (“Common Prayer”) in the Church. It is somewhat analogous to a Missal, a Book of Discipline, or an Order of Worship found in other traditions and denominations. The first Book of Common Prayer was created in England more than 350 years ago, with a goal (among others) of rendering the prayers of worship in the language of the gathered people (in this case, English) instead of the language of the educated elite (Latin). This tradition of common-language worship has continued to this day and the BCP has been translated into nearly every spoken language on earth, and updated to meet the needs of contemporary people. The most recent revision of the Book of Common Prayer in the Episcopal Church was in 1979, and allowed for the option of either “traditional” language (think “thee” and “thou”) or modern language. Based on the needs and desires of local congregations, you may find either option in use at any local celebration. 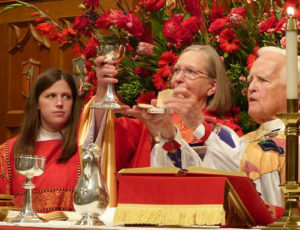 The central act of worship in The Episcopal Church is the Holy Eucharist. The Eucharistic service is a public memorial of the Life, Death, and Resurrection of Jesus Christ, and is deeply connected to the Mass of the Roman Catholics, the Divine Liturgy of the Eastern Orthodox, and the various communion services of Protestantism. As in all church traditions that have a Eucharist or Communion service, the words and actions are modeled after the words and actions of our Savior at the Last Supper, and the particular form of the rite used by our church is found in the Book of Common Prayer. The central elements of the Eucharist are bread and wine, which are blessed, broken, and shared by all. 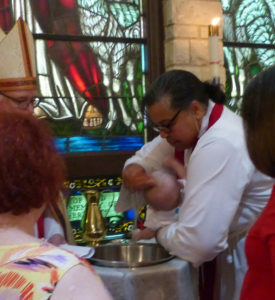 Along with the Holy Eucharist, The Episcopal Church celebrates the sacrament of Baptism, by which we become a part of the Body of Christ (that is, the Church) through water and the Holy Spirit. We who are Baptized in Christ are “baptized into his death,” and are considered born again into the life of Christ, “dead to sin, but alive for God in Christ Jesus.” The Episcopal Church, ever mindful of the fellowship of all believers, recognizes and affirms the baptisms performed by other Christian churches and traditions, and recognizes all the Baptized as brothers and sisters in Christ. The Episcopal Church, and the people of this Episcopal Diocese, affirm the dignity and equality of all human beings. We welcome and respect all people without any exceptions of race, ethnicity, gender, sexuality, orientation, age, or any other reason. We accept vocations to Ordained Ministry (the priesthood and diaconate) among women, LGBT persons, and those married, partnered, single, or celibate. We can and do have female and gay Bishops in our church. Our current presiding bishop is the Most Rev. Michael Curry. He is African American. His immediate predecessor was a woman, the Most Rev. Katharine Jefferts Schori. As important as our inclusion of various sorts of people is our inclusion and welcome of various sorts of Christians. There is no test of doctrinal purity to join our church. You will find among us a wide range of theological thought and liturgical preference. We have liberals and conservatives, moderates and radicals, traditionalists and progressives, and everything in between. The usual joke is that, whatever you believe, you can find an Episcopalian who agrees with you. Another way to say it might be that if you’re willing to put up with us, we will gladly put up with you. More seriously, we believe that we need this diversity of thought. We do not merely tolerate each other- we thrive because of each other. We hope you find our story compelling, and pray that you embrace the work of the Holy Spirit in your life. If you feel called to join us, or just want to check us out some Sunday morning, you can find a nearby church here. This work is licensed by the Episcopal Diocese of Fort Worth under a Creative Commons Attribution-NonCommercial-ShareAlike 4.0 International License.